You don’t have to buy a vintage charmer to enjoy the architectural features and customizations that come with one. Truth is, you can add features to your home’s architecture on your own, which will create a permanent difference in its overall character and design. Crown molding is the most popular architectural add-on. Crown molding is molding that crowns your walls or pieces of furniture. You can buy molded pieces that stick to the walls with adhesive and look like they are part of your wall! Cornice molding is even simpler. One piece of molding separates your walls from your ceiling. Similarly, baseboard molding separates the floor from the walls, highlighting the floor and keeping the walls safe from wear. Also, chair-rail molding lines the walls horizontally halfway between the ceiling and the floor. 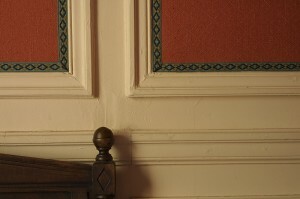 This often goes hand-in-hand with wainscoting, which is a textural pattern that can simply be glued to the wall. Lastly, panel/wall frames display multiple panels of molding on the walls, appearing like empty picture frames. If not the walls, you can also add moldings to staircases, doorframes, columns, ceilings and just about anywhere! To create instant curb appeal, add shutters to your exterior windows. Shutters can be strictly decorative, or they could help withstand poor weather while adding appeal! With a waterfront location, hurricane shutters are more popular than ever. Inside or out, you can add a column here or there to increase the professionalism or elegance of your home. Columns outside make the house stand out and seem important; interior columns can pleasingly flank the walls and separate rooms. Most columns come in white and can be painted to your liking. Pilasters are similar to columns, but these actually attach to the wall and require more assembly. Decorative wall niches add a focal point to a foyer, a hallway or anywhere you wish. You can display your most prized possession inside a wall niche and feel that it is secure. Wall niches include two options: wall-mounted niches, which can be hung anywhere, anytime, or large recessed niches, which require a hole to be cut into the wall. The magnetism of one’s fireplace mantel used to define a homeowner’s social status. Now, it creates a focal point of any room with a fireplace. The mantel on a fireplace adds style, originality, and a place for personal décor. Ceiling beams come in all different styles and can advert attention to otherwise unnoticed locations. Wooden beams cause a room to feel homier and part of nature, whereas modern steel beams allow the room to look futuristic and sleek. Beams are also ideal for adding recessed lighting and hiding wiring! Just adding contrast to a room will make it appear more architecturally interesting. For example, sleek black countertops could counteract crisp white cabinets, while a metallic silver backsplash could coincide with stainless steel appliances. Choose a feature of a room, such as a fireplace mantel, a wall niche or a framed picture, and hang direct lighting to shine upon this prized focal point. This will assure your potential buyers or dinner guests to immediately notice your home’s architectural wonders!